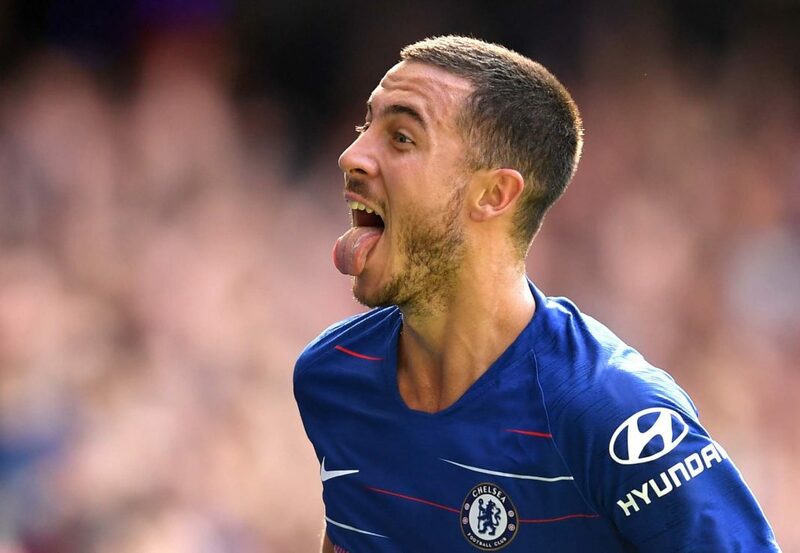 Eden Hazard celebrates after scoring his team's second goal during the Premier League match between Chelsea FC and Cardiff City at Stamford Bridge on September 15, 2018 in London. It’s off to the land of leeks and daffodils this Sunday, as Chelsea travel the 148 miles from SW6 to South Wales to face relegation threatened Cardiff City. With just eight league games to go and a push for the top four on our agenda, we must overcome the physicality of a Neil Warnock team to put pressure on the sides above us for a Champions League place. Prior to the international break, the defeat against Everton was a kick in the teeth, so we must now rise to the occasion, show strength, battle and gain three points. After Callum Hudson-Odoi’s magnificent performances for England during the week, the interest has been if he’ll start his first Premier League game for the club. Hudson-Odoi was the main subject during Sarri’s press conference, with the boss looking a bit exasperated when the same questions were forthcoming. Sarri said that starting in the FA Cup & Europa League was the same as starting in the Premier League, but if I were a footballer with the pace and skill of Hudson-Odoi, then I’d be more excited to start in the Premier League, but, that’s my feeling and not that of Callum’s. Ross Barkley also had a couple of excellent appearances for England during the week. He scored two goals in Podgorica against Montenegro, one goal was supplied by Callum Hudson-Odoi. Our recent Premier League form has been inconsistent to say the least; the win at Fulham on March 3 was our most recent away league victory, but prior to that, our last league win (0-1) was at Crystal Palace on December 30. Us older Chelsea fans will always remember how inconsistent we were during the 80’s to mid 90’s, because our consistency at that time was our inconsistency. During the Roman era we’ve hardly encountered this. So if we’re to remain a successful team, then Sarri and the club need to drum into the players that we need to cut out the inconsistent performances. Olivier Giroud also made a great contribution to the French national team this week; he scored in a 4-0 win over Iceland in Paris and in a 1-4 victory against Moldova in Chisinâu. This follows on from his hat-trick in Kiev, when Chelsea won 0-5. Our other striker, Gonzalo Higuain retired from international duty during the week, all of his concentration will now be on Chelsea, at least until the end of this season. With Giroud being on international duty, the likelihood is that Higuain will start in Cardiff. Higuain’s goals have come against teams fighting relegation (Huddersfield and Fulham) but against Cardiff, could Giroud prove to be more productive? His hold up play could be vital. Cardiff are a bit of an enigma; Warnock (or Colin, as I call him) will have his players trying to chop Hazard down at every opportunity and will try anything to stop us playing our own game. Sarri intimated that he’ll push our defence up so that Cardiff won’t be on top of Kepa when they have the opportunity to attack. Although I’ve said this before, most notably against Everton, we have to finish our own chances when we attack. Our last visit to the Cardiff City Stadium was in 2014 when, on the last day of the season, we won 1-2. Goals came that day from Andre Schürrle and Fernando Torres. Cardiff were relegated that season when they had a certain Ole Gunnar Solskjær in charge – maybe he’ll manage to do the same for Man United next season. My Prediction: it could be a feisty game, with maybe a red card involved (for Cardiff) if Higuain starts I can see him scoring a goal, if not, maybe two. But after Cardiff beat West Ham in their last home game, we really must concentrate and not fall into a spell where we could be pushed back and/or give away unnecessary free-kicks in and around the area. If we can score early and make our possession count, then I’ll go with a 1-3 win.